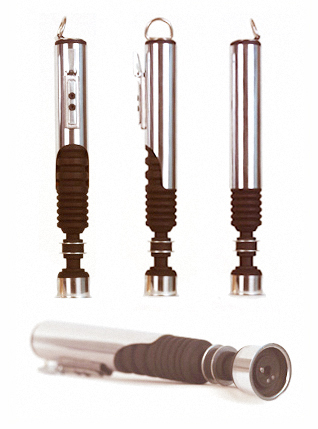 I know what you’re thinking – another post about lightsabers? Well, this will be the last one, for a while at least. Consider it a bookend to this post. My Saber. Design and Image Copyright Jason Patz. All Rights Reserved. In this week’s TotW you get to see what my lightsaber looks like. I can’t remember exactly when I built it but it was around the same time as the trainer saber. Just as before, I thought through exactly what features I’d want and where I’d want them placed. After all, a lightsaber is a personal thing – not in the sense that it is secret but that it is intended for one person’s use. My Saber. Design and Image by Jason Patz. All Rights Reserved. I won’t go through all the details as they have been explained in the other saber posts. I will mention that this one does have a functional button that turns the custom blue-green LED on. It is powered by a super-compact battery pack out of some random broken electronics that is stored in the base of the hilt. Unlike the trainer saber, I never finished this one completely. You’ll notice a hole around the power button and a blank bump in the left side of the hilt. The power button hole was to have a custom black rubber piece to seal it and then be covered by another piece of chromed tube. This would have sealed up the hole nicely, given the saber a waterproof look and added a cool black line in some type of pattern around the power button. I was thinking of something like the pin striping on a custom painted hot rod or motorcycle – something with a dynamic shape. The bump was to have a pop-up twist knob for blade length adjustment drilled into it. My thinking was that adjusting the length of the blade easily based on the fighting environment would be a handy feature. How cool would it be to have a claymore-length lightsaber to berserker with in a big open field? The same limitations from the trainer saber popped up here. I didn’t have access to a lot of tools so I had to use a lot of existing parts. I managed to get the overall shape almost exactly like I wanted it, but not with the level of detail. If I had been able to use a metal lathe to make these parts I could have increased the thickness of the parts allowing for a more exaggerated profile that would have been much more interesting. 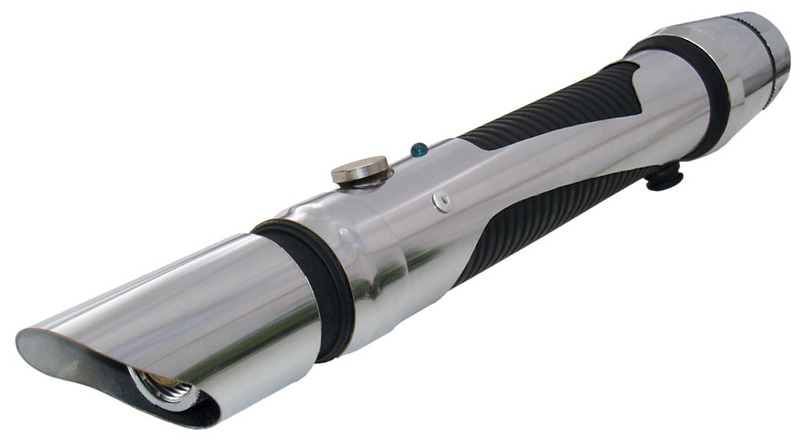 For example, the emitter shroud is the same diameter plumbing tube as the body of the hilt. I think it would look much nicer if the emitter could be a larger diameter. I’ve been sketching saber designs on and off for years and, besides Obi-Wan’s Ep. IV saber, this is my favorite one. I’m happy with the way it turned out. Maybe one day I’ll remake it when better resources are available to me. Whaaaa? You say. Is it possible that we get two TotW’s after such a dry spell. Well, kind of. Not really. But in putting the post about my trainer saber together I gathered all of my saber resources. Mixed in there was the first saber I ever built that was for a friend of mine. It is made out of plumbing parts, lighting parts and wood. He wanted something that was reminiscent of Obi’s Ep IV saber and Luke’s Ep VI saber. Being a design guy I had to do some user vs. item to be used methodology. We used various tube diameters to get the best fit for his hand and placed the on/off trigger in his preferred location. We worked out the right length for a comfortable two-handed grip. The blade length and intensity are controllable on this model through two pop-up knobs in the bottom of the hilt. Consider this behind the scenes bonus material for the TotW. If you like Star Wars, I know you like secret behind the scenes bonus material too. It is engrained in you. Behold my first saber it all of its low resolution glory (It is the only image I still have of it. Notice the better lighting though. Man, I miss having a good camera and photo studio)! It’s Friday and that means Thing of the Week. Yes, it is hard for me to say that with a straight face. I am so far behind on these I don’t know if I can come close to catching up by year’s end. However, I am partially fulfilling a promise I made to you here when I discussed the greatness of the lightsaber and its impact on the SW franchise and me. As discussed there, I could never find a decent lightsaber toy or prop so I decided to build my own out of plumbing parts, lighting parts, wood and resin. I have two sabers to show you and this is the first of them. As many of you no doubt know, one of the last things a padawan does to prove that he or she is ready for jediship is to build his or her own lightsaber. This is how the movies explain all of the variation in the hilts and blade colors. But as I approached the task from a design perspective I quickly realized that there must be some sort of trainer saber. Probably some standard mass-produced design. This was long before the prequel movies so I only had my imagination and reason to guide me. As deadly as these weapons are, there must be an intermediate step. Something that might hurt or even maim, but would not kill or destroy – like the shinai that is used in place of a katana when one practices kendo. There would probably need to be a lot of them (At the time there was nothing that indicated how many Jedi or initiates there used to be – only more). They would almost certainly be standardized for easy production, repair and maintenance. I envisioned a quartermaster with racks of these things charging for the next practice round. They would be free of much ornamentation not only for easy production but for more universal use. 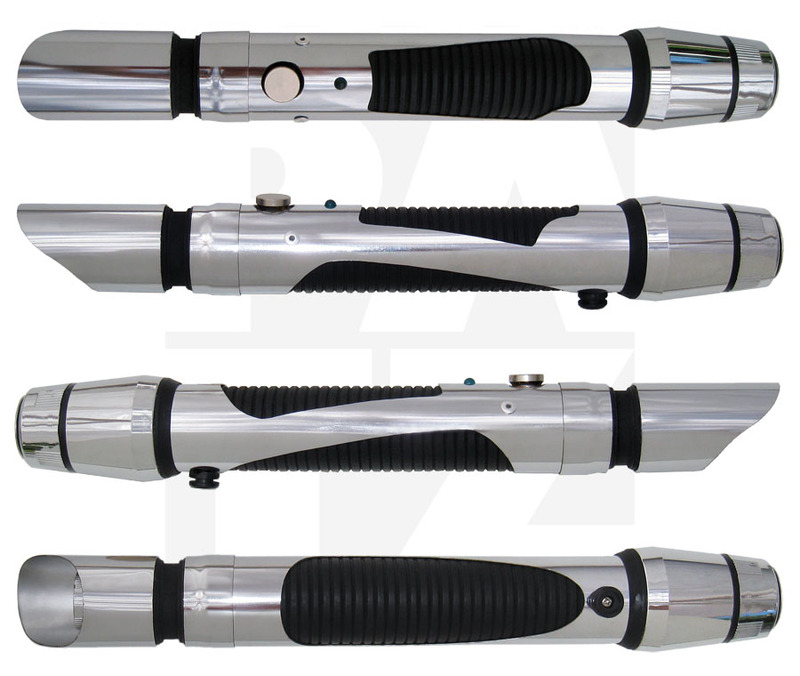 You never know what kind of hand, pincher or tentacle is going to need to grip these hilts. For the same reason the controls would be simple and obvious – an oversized red button within easy reach on the top for on and off and two set screws recessed into the bottom of the hilt for blade length and intensity on the bottom. They also needed a battery life indicator that would be prominently displayed. It would double as a simple diagnostic indicator when in that mode. A diagnostic probe and charging tool could be hooked up at the small port on the top of the saber. The emitter shroud would be large and simple to provide maximum protection and minimal opportunities for over eager sleeves to catch on. Top Front and Side View. Design and Image copyright Jason Patz. Next up will be my own personal saber. I hope to have that for you next week. There you will see that I addressed the two most common comments about the trainer saber: 1. It looks a lot like a flashlight. 2. Does it do anything? Not all that long ago a friend of mine had jaw surgery to correct a severe under bite that prevented him from chewing with his front teeth. First he had braces, then they did the surgery, then he had a small accident and had to have his jaw reset (Ouch!) and finally his braces came off. I asked his wife to take consistent front and side view pictures of him throughout the process so I could use them as key frames in an animation showing his transformation. You can view the animations below. Probably the most interesting part for me is at the end when he morphs from his new face to his old one. I’ve also included an image I photoshopped predicting what I thought he might look like after he was all healed up. For a select number of years the shared experience that pulled me from autopilot and forced me to consider my age was a person’s first viewing of Star Wars. We want to think that basically everyone is the same as us, but in instances like this we are reminded just how different we are. Today the discussion rarely comes up, proving that I’m even older now. Those of you that personally know me will find it hard to believe, but I didn’t really like SW that much when I first saw it. Mom and Dad had heard all the hype and decided to check it out. They determined that it was ok for my brother and me to watch it and for a few days (or weeks – movies ran for much longer in the olden days) my mom tried to build it up. “You won’t believe what you are seeing. All these big ships. Lasers. Light-up swords. It is so cool!” It didn’t make much sense to me but I was always happy for the rare treat of a movie. I don’t remember a tremendous amount about that 2hr 1min spent at the Westbury Twin. The beginning was loud. Man, that ship is biiiiggg. Why are the bad guys wearing both black and white armor? Obi-Wan Kenobi sure is cool. Han Solo is funny. I could be friends with Chewy. It’s kind of dumb that the bad guys can’t shoot better than that. I think maybe all of this stuff is real somehow. What did stick out in my mind was this scene. I wanted to have a club house just like Obi’s Jundland Waste chalet. Scorching dry winds. Sand everywhere. Curvy hard stuff to sit on. In all seriousness, it would have been so cool to have little fort in the backyard that looked like that. Most importantly, I wanted that light-up sword! For years I have believed that no single thing contributed to the SW movies success more than the lightsaber. Everything else could have been terrible but this one well-executed bit of design would have produced at least a mediocre movie. Imagine that – a single prop cobbled together from grenades, lighting equipment, plumbing fixtures and such is capable of making a successful movie. It never really occurred to me that things like this would be for sale so I didn’t really picture myself owning one. Remember, SW was the first movie that really made the strong connection of movie and merchandise. They were figuring it out on kids like me (and making Senior Lucas mucho dinero). Sure we loaded up on action figures and playsets. We saved our proofs of purchase and got the mail-in Boba Fett. What I really wanted was a good lightsaber toy. I’d seen that inflatable one at friend’s houses. Invariably it was sitting flaccid in the corner looking stupid. Played with once but, upon contact with a bratty sister’s head, now broken and tossed aside. It needs to make the sounds. It needs to go in and out and light up just like a real one. It needs to look cool with real metal and switches and light up buttons. It needs to be solid so I can hit people and things with it. Luckily for kids watching the theatrical re-releases, technology caught up with design and you can own an electroluminescent-bladed, really-truly sounds-right, prop-accurate lightsaber today. You can get cheap toys that look pretty good and have a fairly solid extendible and retractable blade. You can get all colors and hilt designs. This product line is now so super saturated that you can get the one used by that Jedi that only appears in the back corner of one shot before she is beheaded. 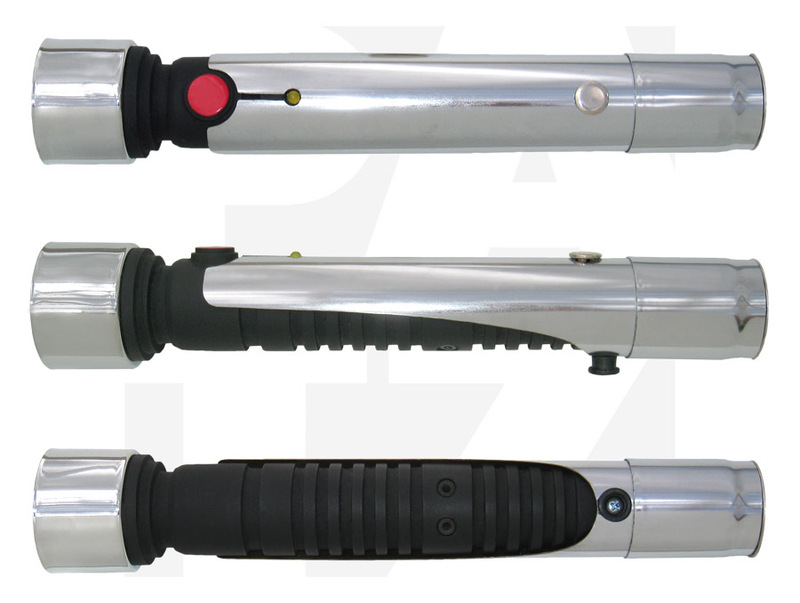 Years before all of this merch was available, I decided to take matters into my own hands and I designed and built my own light saber hilts. I’ll show you pictures and give you details soon. I’m looking forward to sharing this with you. 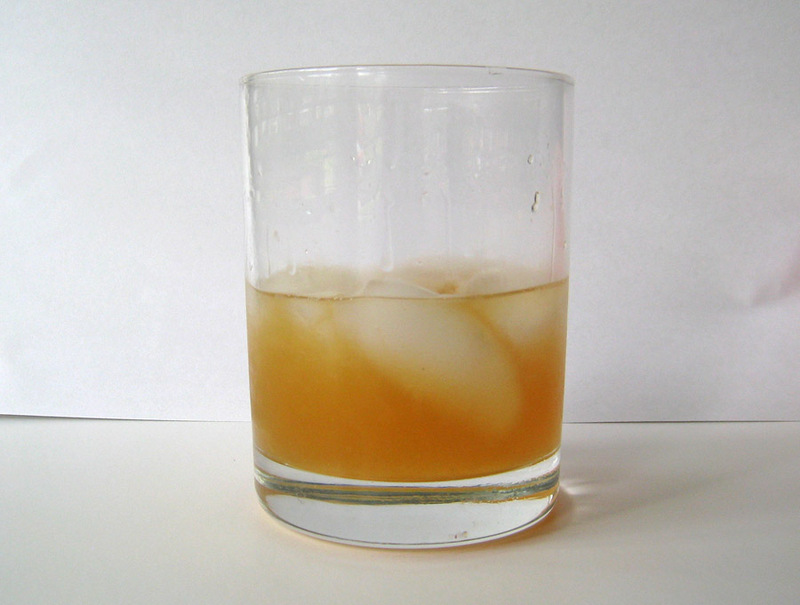 UPDATE: Jump to the end of the article if you just want my best recipe for a Whiskey Sour. Those of you that know me personally know that I’m not a big drinker – even less now that I’ve developed an allergic reaction to some kinds of beer. However, I love learning new stuff and when I saw this post by Brad Guigar my curiosity about the Whiskey Sour was piqued. I am no bartender and have only set foot in a bar a handful of times so I hit up the internet for some drinks knowledge. After fumbling around for a while I determined that probably the most “official” Whiskey Sour recipe comes from the International Bartenders Association. If I’m going to do it, I might as well do it right. Pour all ingredients into cocktail shaker filled with ice. Shake well. Strain in old fashioned or cobbler glass. 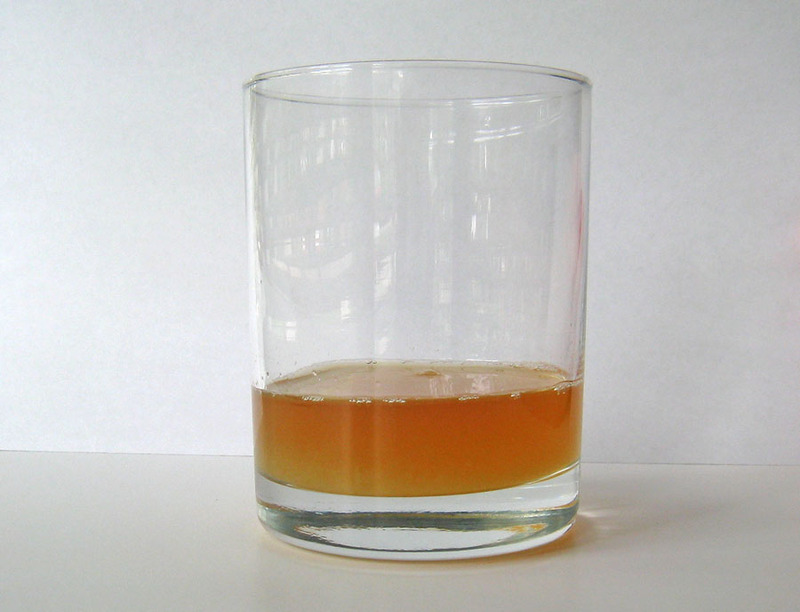 If served “On the rocks”, strain ingredients into old fashioned glass filled with ice. 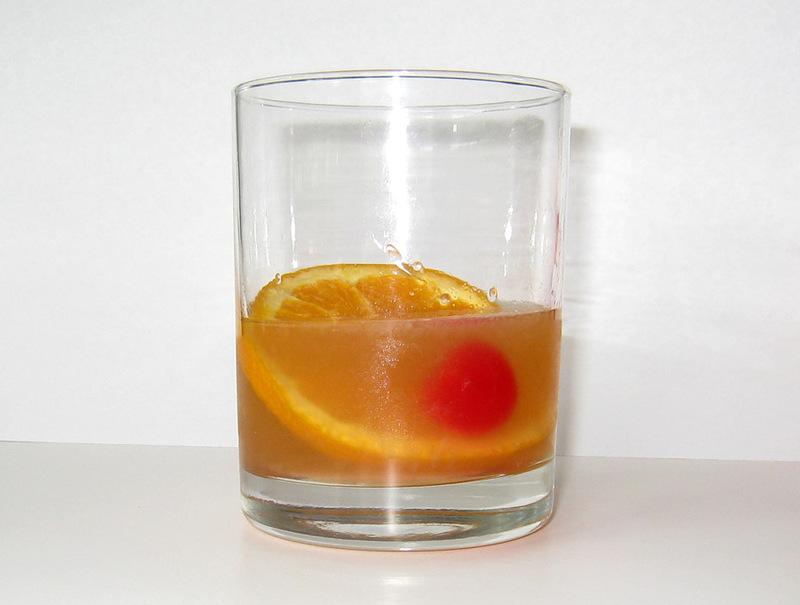 Garnish with half orange slice and maraschino cherry. So a Whiskey Sour is basically tart bourbon lemonade. The name makes me think of an old western tough guy drink, but when you describe what’s in it, it loses some of its masculinity. Testosterone points are deducted for the cherry and orange wedge too. Reviewing the recipe, first I had to determine how many cl’s were in a tablespoon so I could see how big a single serving is officially supposed to be. I had already cleverly deciphered their code and realized that the ratio was three parts to two parts to one part. It turns out that 1.5cl is quite close to one tablespoon. Second I had to figure out what the heck gomme syrup is. You can read about that adventure in this post. 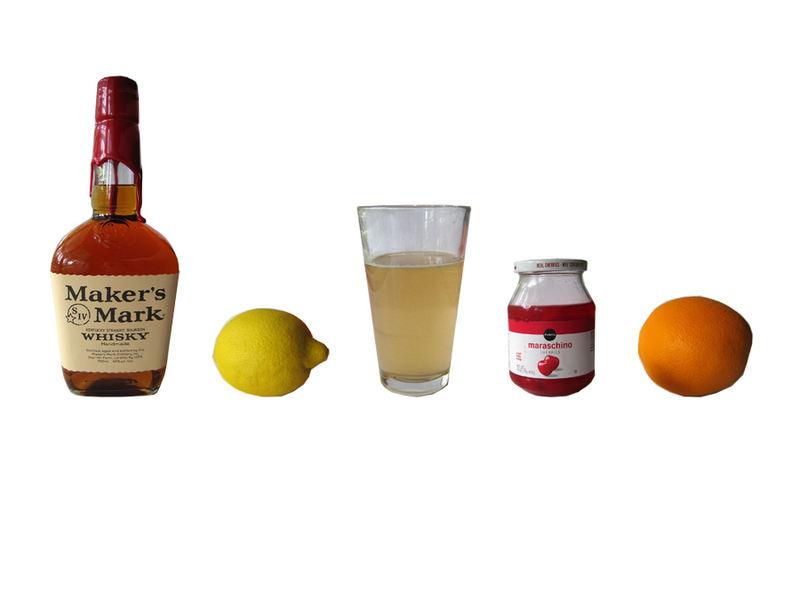 Below is the photo-packed process of making a Whiskey Sour with additional notes. Step 0. Collect ingredients: bourbon, lemon, gomme syrup, maraschino cherries and orange. Ok, I didn’t photograph everything. You need to juice the lemon and cut the orange into thin half slices. Strain the lemon if you don’t want pulp. Step 1. 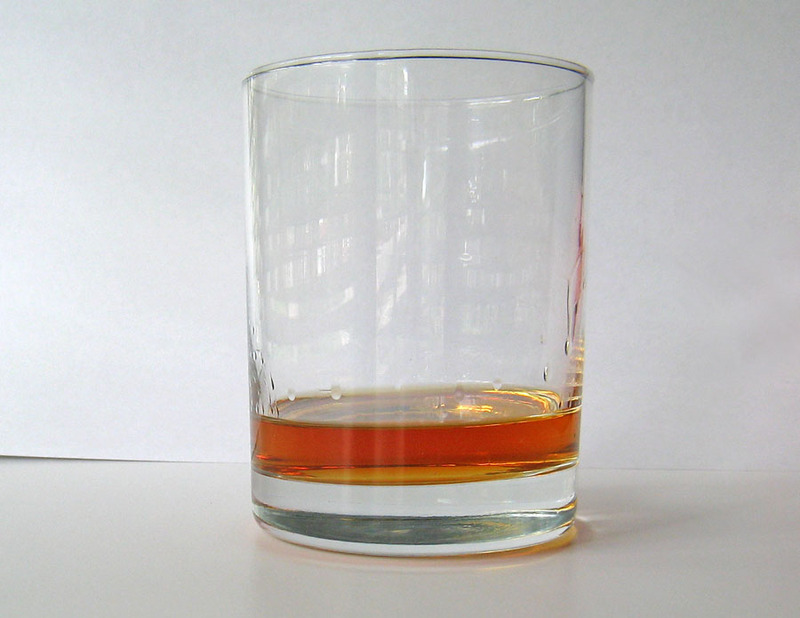 Pour three tablespoons of whiskey in an old fashioned glass (or shaker). Since the bulk of this drink is whiskey, I thought getting an affordable but tasty one made sense. I probably spent the most time on this project researching what the gourmands and drunkards like best. Suggestions were all over the place with some folks demanding high-end micro brew super dupers and other proclaiming the merits of Wild Turkey. Eventually three brands bubbled to the top: Woodford Reserve, Maker’s Mark, and Jim Beam. Woodford and Maker’s were deemed to be the richest flavored but still priced for mere mortals. Jim Beam and Jim Beam Black Label were said to be inoffensive. No bad flavors in them and good for mixed drinks. Side Note: For champagne-like naming reasons, Jack Daniel’s cannot be considered a true bourbon, but I bet it would be tasty in a Whiskey Sour nonetheless. Step 2. Add two tablespoons of fresh lemon juice. It really does make a noticeable difference using fresh lemon juice or lime juice rather than bottled when called for in recipes. Step 3. 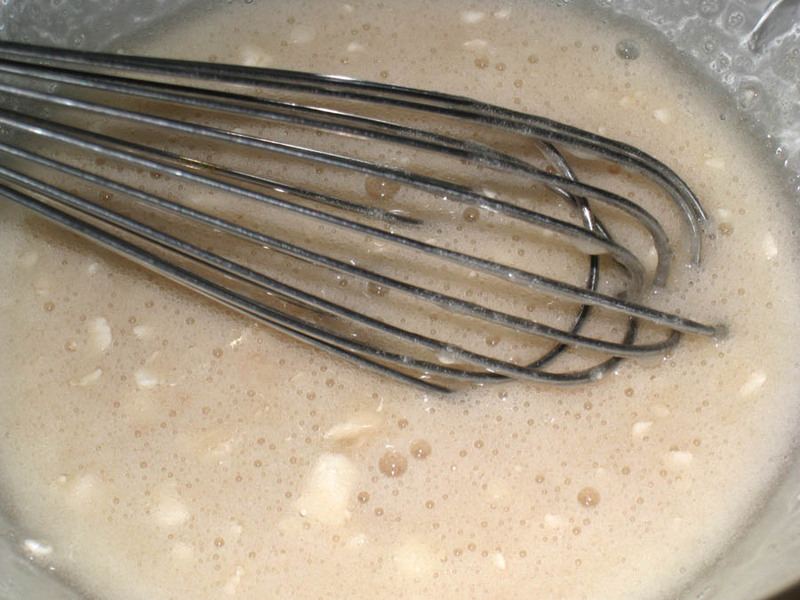 Add one tablespoon of gomme syrup. I tried the recipe this way but I guess I’m just I’m too much of a sugar lover. I think two tablespoons works better. Step 4. Add ice. Shake. Pour through strainer into glass. D’oh! Didn’t photograph this either. Also, I left out the egg white as some places list it as optional. Step 5. Add orange half slice and maraschino cherry. Drinkitup! I used a whole slice of orange. I thought it would be easier to fish out of the glass. A. If I had used less flavorful bourbon I think the gomme syrup would have been more important. If it was a blind taste test, I don’t know if I’d be able to tell the difference between a Whiskey Sour using gomme and one using standard rich simple syrup (2 sugar : 1 water). For you taste testers out there, I do think gomme is worth a try. You might love it. B. The standard recipe doesn’t give you much of a drink. Either put this thing on the rocks or make it a double. C. The orange is a waste and a hassle. It just gets in the way when you are drinking. It doesn’t add any flavor unless it is served perched on the side of the glass where it can be squeezed into the drink. D. There is no need to mix this drink in a separate shaker unless you want the theatrics. E. The egg white is optional. Like the orange, this seems like an unnecessary hassle to me. F. Stick with the lower alcohol content bourbons. It is almost half the drink. If you use Wild Turkey 101, I don’t think you’ll taste much else. Combine bourbon, lemon juice and gomme syrup in an old fashioned glass. Stir well. Add ice. Stir again. I decided that I was going to learn how to make a Whiskey Sour and one of the ingredients is gomme syrup. I’d never heard of it before. Hooray! A chance to learn something else new. 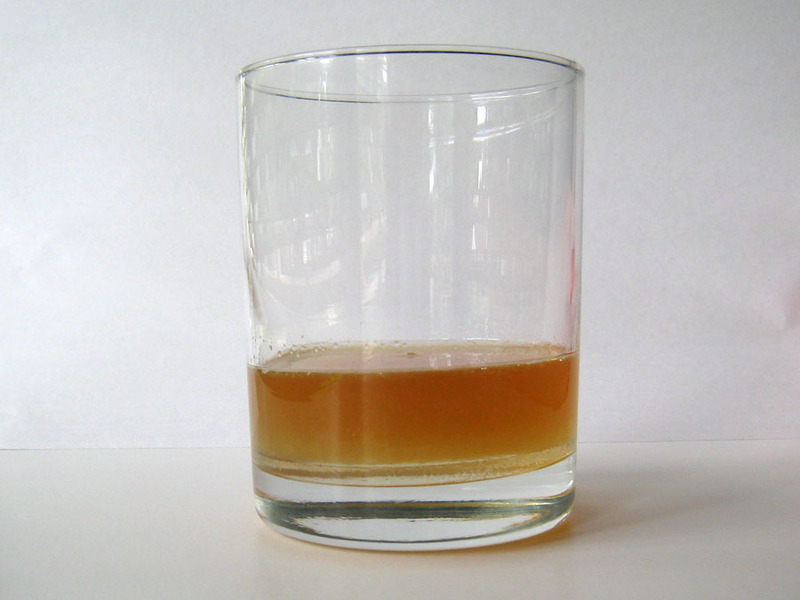 I think the reason most people don’t use gomme syrup and it is not more widely carried in grocery or liquor stores is that you can buy mix kits for whiskey sours that combine most of the ingredients for you. It turns out that gomme (French for gum and eraser (yum)) syrup is just rich simple syrup with gum arabic added as a stabilizer. Many people know that simple syrup is just one part sugar dissolved in one part water. Rich simple syrup is two parts sugar in one part water. The problem with this solution is that the sugar wants to recrystallize. Enter the gum arabic. It keeps the sugar in solution and thickens it. For the purpose of mixed drinks, gomme syrup has the added benefit of imparting a light but complementary flavor to the drink. The added viscosity gives the drink a more silky feel and it takes the edge off high-alcohol drinks. All of this sounded great to me so I thought I’d track some down. I looked at Publix, Whole Foods, Native Sun and The Grassroots Market. I tried three different liquor stores and none of them had heard of it either. The next step was to try and make it myself. I had to find the gum arabic and it needed to be food-grade quality (it is also used in inks, photography supplies, etc). Gum arabic is actually dried and powdered tree sap from two different species of the acacia tree. 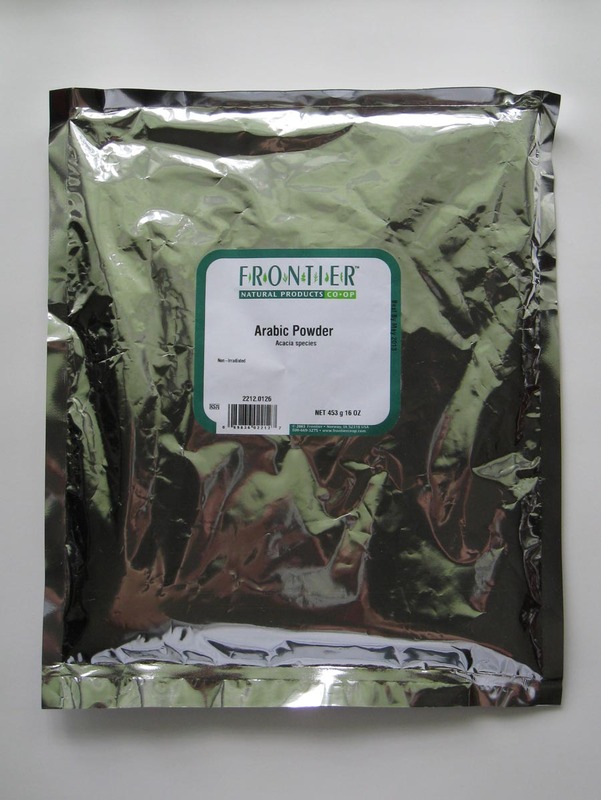 For this reason it is sometimes known as acacia powder or arabic powder. It is harvested in West Asia, Africa and Arabia. Whole Foods and The Grassroots Market told me over the phone that they had it but ended up they did not. They had a soluble fiber for irregularity that had a similar sounding name. I ended up purchasing it at the same place several folks on cocktail websites recommended called Frontier Co-op. I wanted to see what the raw powder tasted like so I sampled the tiny bit that spilled when I was measuring it out. Nothing. I poured a little more on my hand (1/4 teaspoon?) and ate it. Again, it almost tastes like nothing. At first it made my tongue a little sticky then it felt thick and silky in my mouth. It has a slight aftertaste of some sort of spice. Maybe a little like cumin? Maybe if un-malt was a flavor that would be it. It is hard to place, but I can see how it would be a nice compliment to most mixed drink flavors. Sifting through the few recipes I found online, they were all very similar and very simple. If you can make Jello or instant pudding, you can make gomme syrup. All of the recipes used ounces for their measurements. They never clarified if this was weight or volume and I remembered that there was some difference between the two. A quick internet check reminded me that a dry ounce is a measurement of weight (use a scale). A fluid ounce is a measurement of volume (use a measuring cup). One of the recipes that was more precise used grams for the gum arabic. This lead me to believe that the dry ingredients were probably measured on a scale so that is what I tried first. You can see from the picture below that this didn’t work out too well. On the left we have the gomme syrup made with weighed ingredients. On the right we have the one made using measuring cups. I wish I had made a video of the one on the left. It was very close to the consistency of taffy. I think I could have set a spoon on it and it wouldn’t have sunk in. 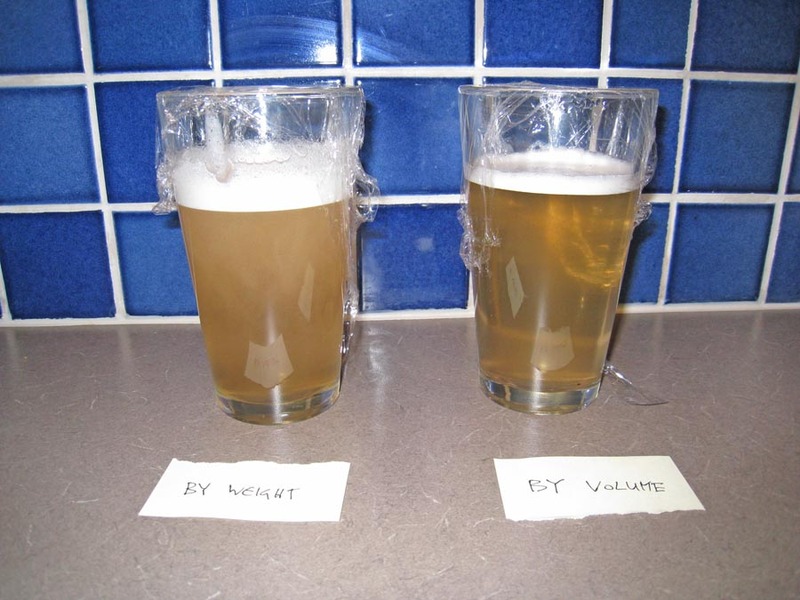 The one on the right has the color and clarity of cream soda. The one on the left is much more opaque. They both tasted about the same. Candy! Here is the recipe I used with photos showing how I made it. Bring water to boil in microwave. While still hot add gum arabic and mix until smooth. 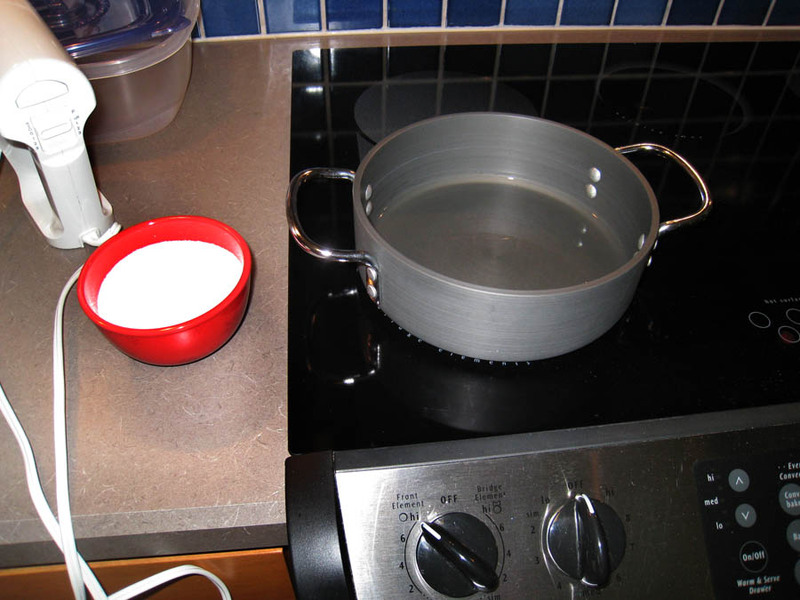 Bring water to boil on stove. Stir in sugar until completely dissolved. Add gum arabic mixture. Boil for two minutes stirring constantly. Remove from heat and allow to cool. Scoop off foam. Bottle and let rest for a day before using (for clarity). It's Lump. It's Lump. It's in my Bowl. Electric Mixer to the Rescue. Schmoove! Step 1. Combined hot water and gum arabic. You can see that I tried to mix this together with a whisk first but that would have taken forever. The electric mixer took care of the remaining lumps. Heating Water. Sugar ret to Dump. Step 2. 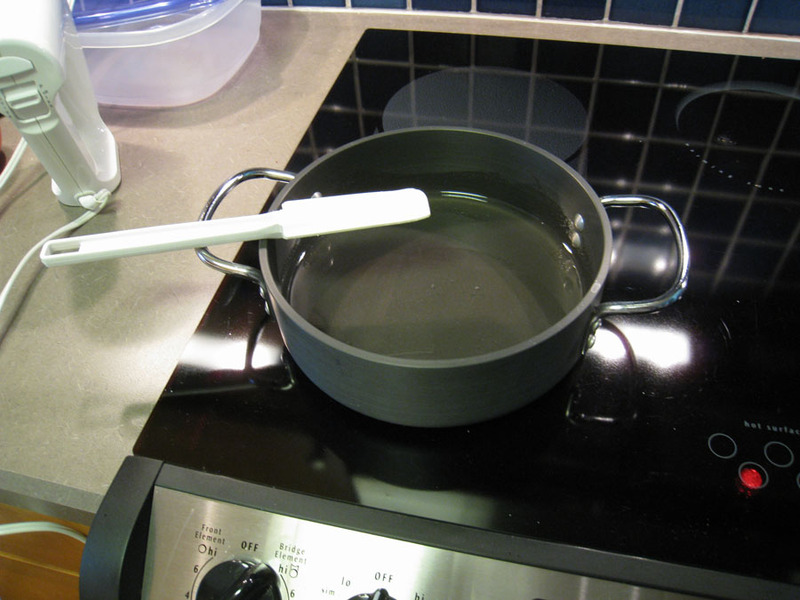 Boil water on stove. All the Sugar will Dissolve. See? Step 3. Dissolve sugar in boiling water. 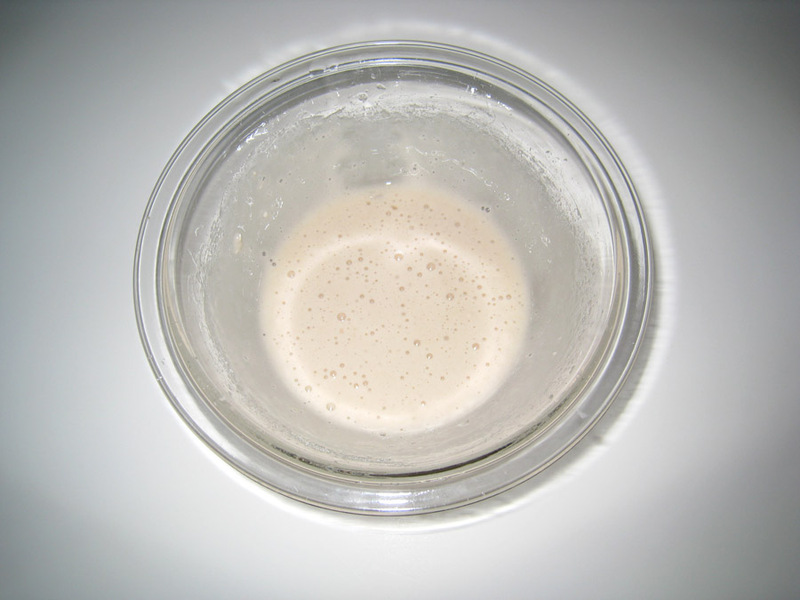 Granulated sugar will dissolve quickly and easily. Confectioner’s (powdered) sugar contains about 3% cornstarch so don’t use that. Step 4. Add gum arabic mixture to sugar water and cook for two minutes (not pictured). Right After the Pour. Still Mostly Opaque. Step 5. Let mixture cool. I poured it in a glass to concentrate the foam and make it easy to remove. Step 6. Bottle and save for use (not pictured). Overall, I think it is an improvement over simple syrup and I’m glad I made it. The gum arabic is a little pricey (but will probably be a lifetime supply) so it is hard to say if it is worthwhile for everyone. 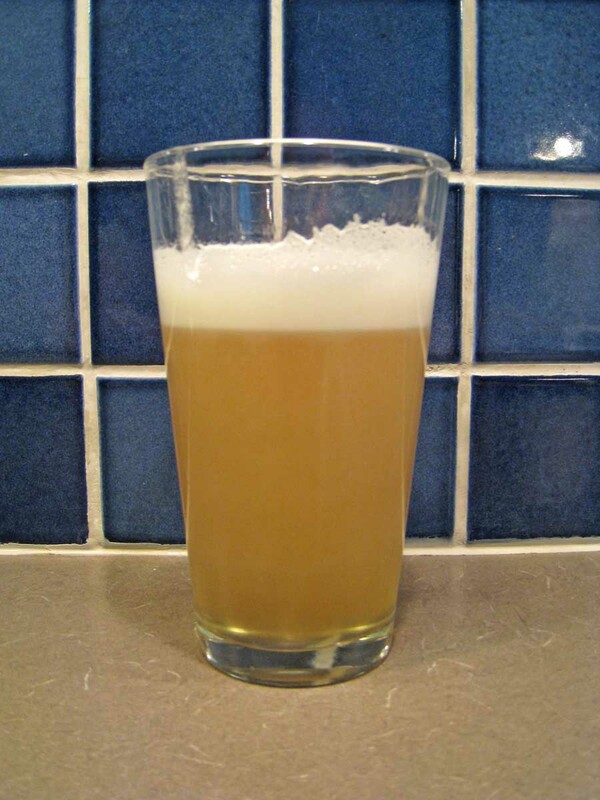 It is easy to make and store and one batch will make a lot of drinks so it is very convenient. I bet you’d thought I’d given up on these. Well, I haven’t. 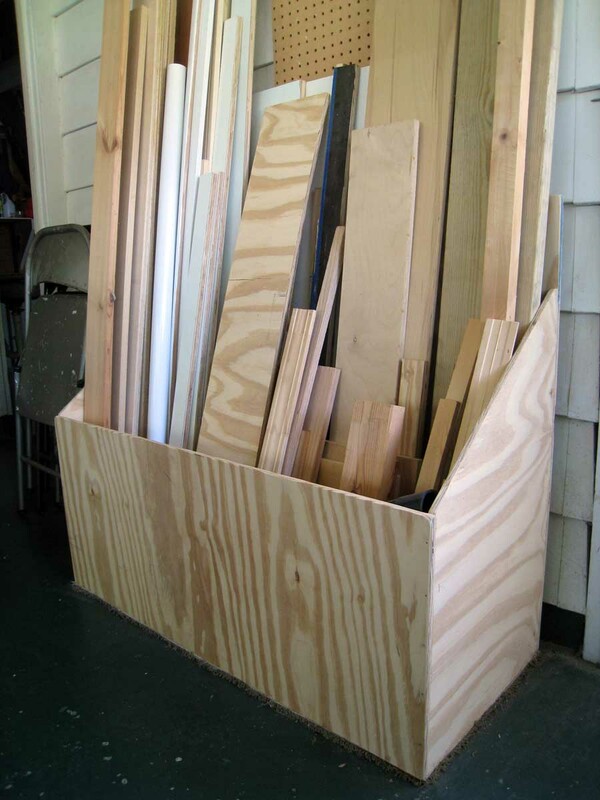 I never posted pictures of the completed wood storage box that I discussed here. It really makes my shop space look nicer, gives me more room to work and keeps things organized better. I won’t be building the bike rack that I discussed in the previous post linked above. Instead I’ve decided to pull the trigger and build a small shed in my backyard. It will house my lawn and garden stuff as well as the bikes. This will be great! We have plenty of space for storage now, but we don’t have space for storage and a shop. This will allow me to really use the garage rather than just pile stuff in there. I can hardly wait to get started on it. I just need to finish up our TV room end table. Hopefully that will be the TotW for next week. I designed it a while ago and started on it this morning. 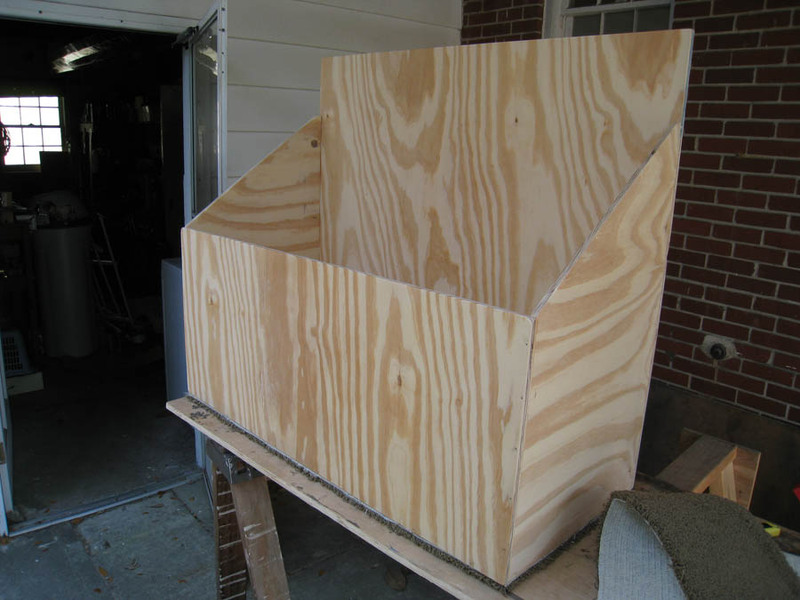 Below are pictures of the finished wood storage box. It is made from a single sheet of 1/2″ unfinished plywood to keep the weight down. I used carpet tape to secure some scrap carpet to the bottom. 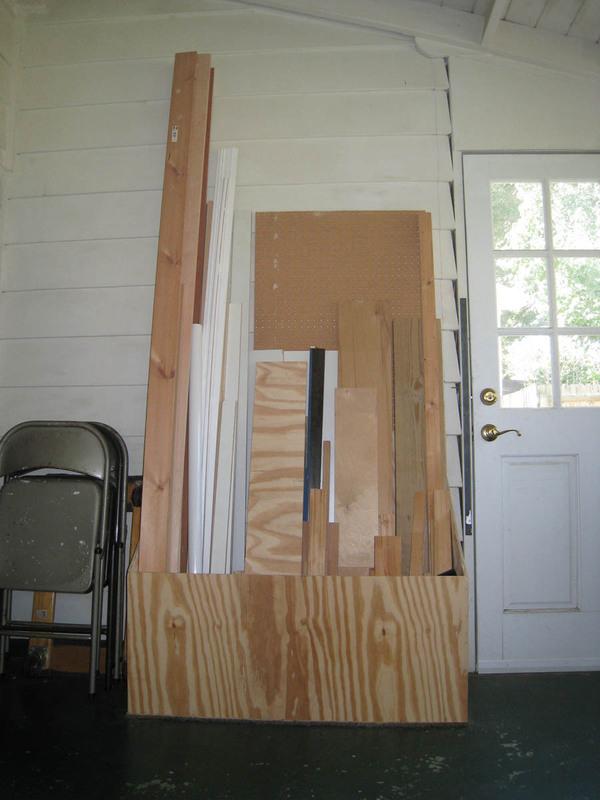 This helps keep floor moisture out of the wood, prevents it from scratching surfaces and makes it easier to move around when loaded. The entry shelf I started working on a few weeks ago has been complete and installed for some time. I didn’t scribe it perfectly to the wall in a couple of places so I caulked and painted the edges yesterday. Mistake. It looked better without the caulk. Because the paint sits at an angle on the caulk (not perfectly vertical like on the wall), it catches the light more and looks lighter. It isn’t bad looking but it was better before. Lesson learned. I’m also a little sad that the wood lost its silvery white color, but I knew that it would. It picked up the strong amber cast of the polyurethane I applied. Not bad looking at all (actually a better compliment to the floor) and about as durable a finish as I can apply. The finish also allowed some of the cool refractive properties of the wood to show through so it looks lighter or darker in different areas depending on your viewing angle. 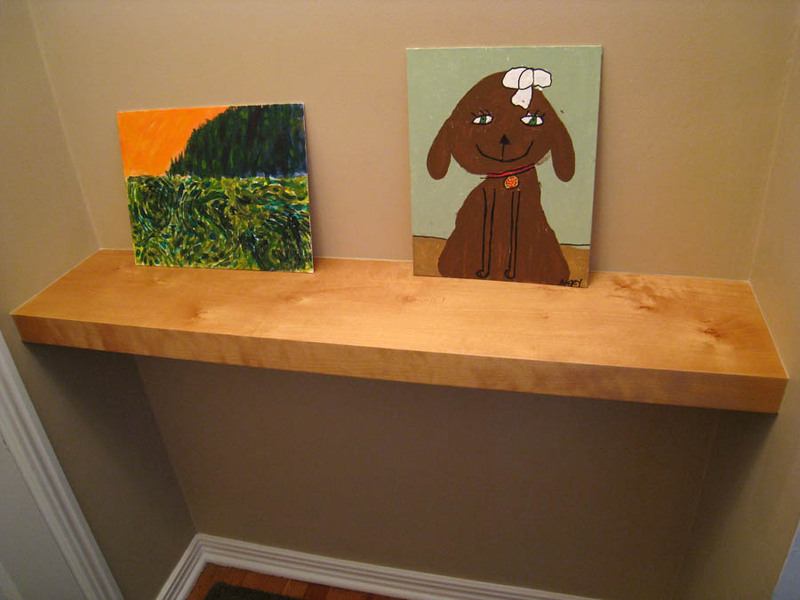 The artwork is courtesy of two of my nieces.